This Right-Angle SIM card Extender is an essential debug and test tool for mobile and cellular m2m development. Designed with Gold Plated contacts, and a (FPC) Flexible Printed Circuit cable, it has the reliability to be used as a production component. The tool allows a SIM Card to be extended from the host slot for the SIM interface. It's especially designed to save valuable labor and time in the production environment. 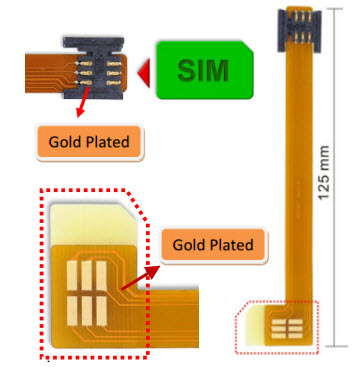 This SIM extender is designed to minimize the signal degradation effects of the extender by proven design techniques, and is a powerful tool for engineers, or use for mobile phone, m2m module SIM test protection.